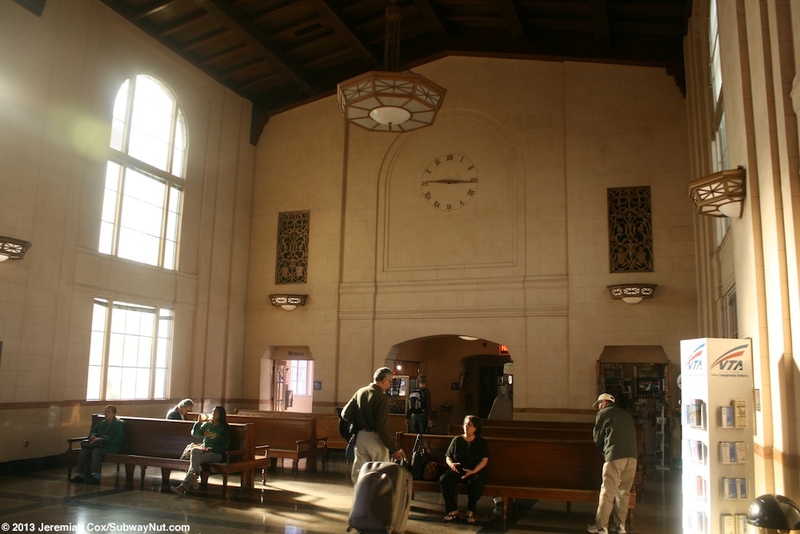 San Jose Diridon is a historic central city train station in the currently third-largest city in California. The depot was dedicated on December 30, 1935. The Italian Renaissance Revival Style station was built by John H. Christie, architect of the Southern Pacific Railroad. 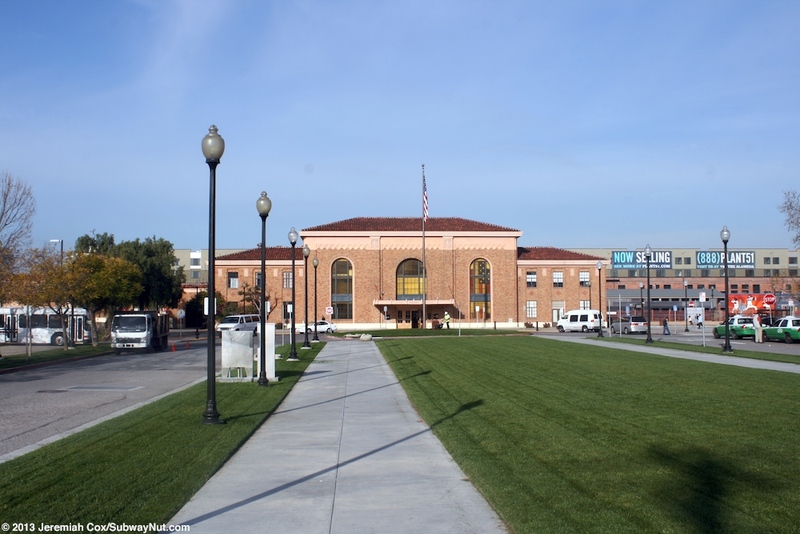 The station was part of a project to reroute the railroad away from the center of San Jose (and keep trains from blocking downtown streets) and onto trackage through a more industrial area about a mile west of Central San Jose. The fact the station is in downtown, your webmaster learned the hard way nearly missing the northbound Coast Starlight getting dinner and forgetting just how long the walk is back to the station (the VTA light rail was running only half-hourly service so taking it wasn't an option). 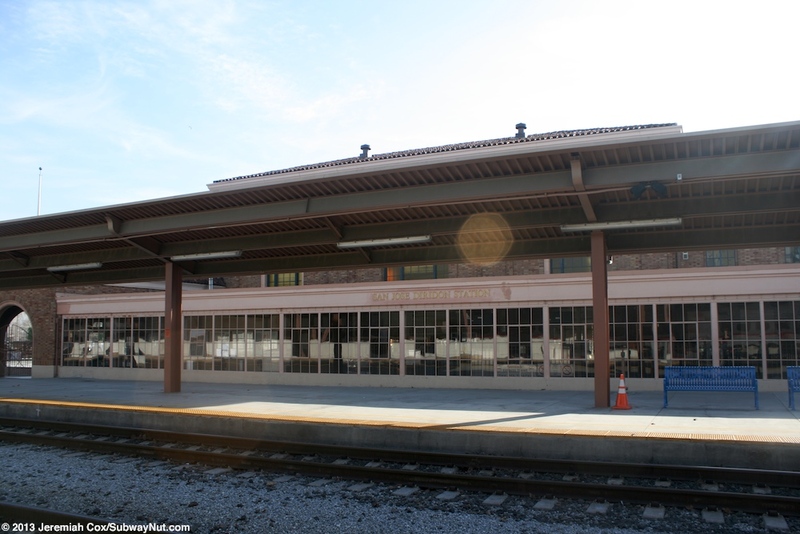 The station was known as the Cahill Depot or Southern Pacific Depot until the name became San Jose Diridon with a dedication ceremony on December 8, 1994 in honor of then-Santa Clara County Supervisor Ron Diridon, a charter member of the Peninsula Corridor Joint Powers Authority (that was set-up to run Caltrain). For train service the station has seen continuous commuter service on the Peninsula Line up to San Francisco. This service was originally known as the SP Peninsula Commute. 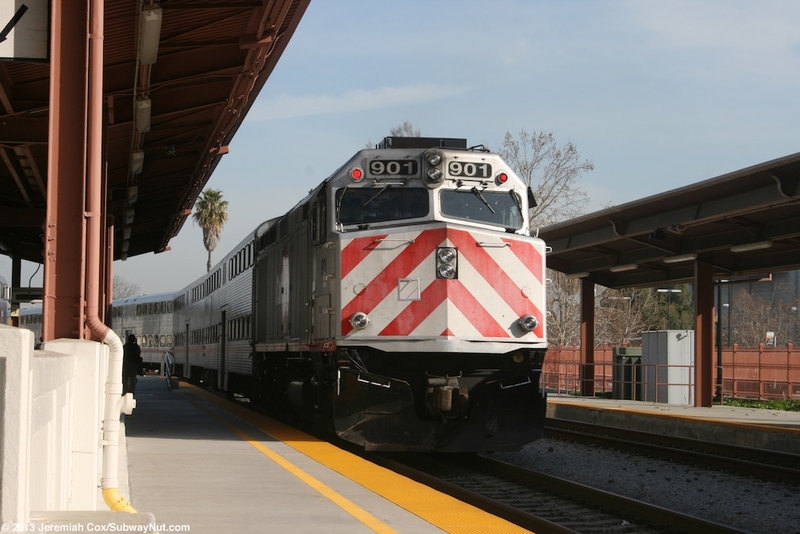 In 1980 the Caltrans (the State Department of Transportation) began subsidizing the service and it became know as CalTrain. In 1987 the Peninsula Corridor Joint Powers Authority took over operations from the state (with Ron Diridon) and Caltrain (renamed in 1997) is now under local control with funding at the whims of the three counties since it lacks dedicated funding. 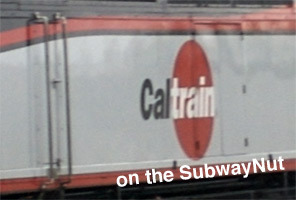 On July 1, 1992 some CalTrain trips were extended south from San Jose for the first time with relatively frequent service to Tamien (a Park & Ride Lot south of Downtown San Jose) and peak direction rush hour service (originally 2 trips, now 3 per day, 4 at a peak) to Gilroy 30 miles south of San Jose down the Main Line (trackage is shared with Amtrak's Coast Starlight). Today all 46 weekday (including 11 weekday Baby Bullet Express Trains and all service Limited during rush hour bypassing certain stops) and 18 Saturday and 16 Sunday (including 2 weekend Baby Bullet Express Trains) round-trips run from San Jose to San Francisco providing hourly or better service. 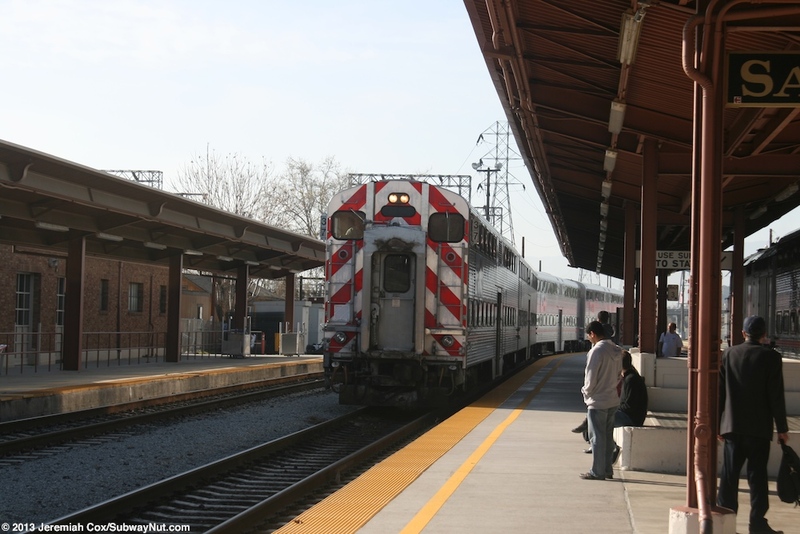 All service to and from San Francisco has been only provided by Peninsula Commuter Trains (Caltrain) since the creation of Amtrak in 1971 before that the SP ran the Coast Daylight and other trains such as the Del Monte, a local train from San Francisco to Monterrey also survived until A-Day. On A-Day, Amtrak extended the Coast Daylight up to Seattle, rerouting it the Coast Starlight and it became the only other passenger train to stop in San Jose in addition to the Commuter Trains (except for the short-lived overnight Spirit of California from Sacramento to Los Angeles from 1981 to 1983). 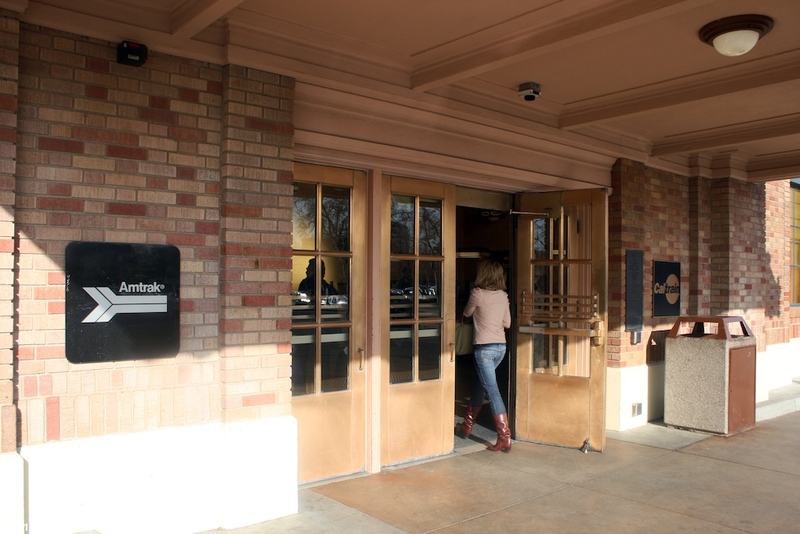 On December 12, 1991 the Capitols entered service from here to Sacramento (one trip to and from Auburn) with 3 daily round-trips. This number has since been increased to seven. 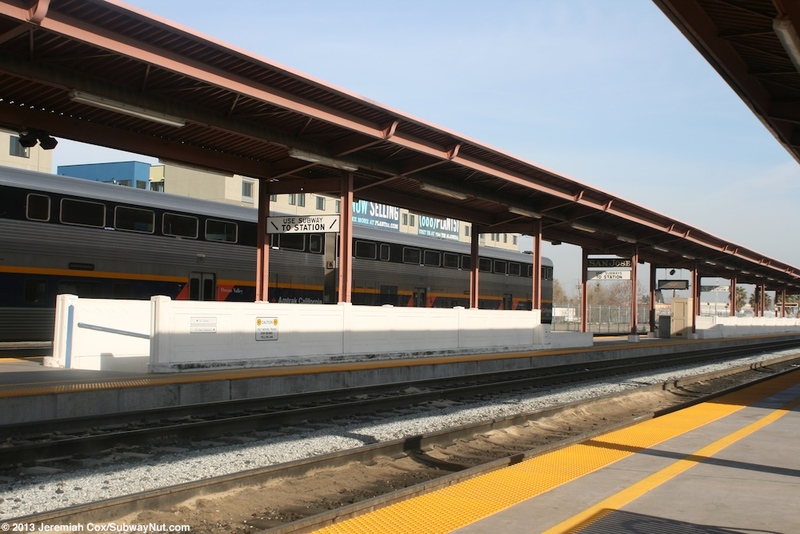 Additional Amtrak California Thruway bus service provides additional frequencies (to just the Coast Starlight) between San Jose and points south, connecting to Pacific Surfliner trains in San Luis Obispo or Santa Barbara and Capitol Corridor trains here (or in Oakland). 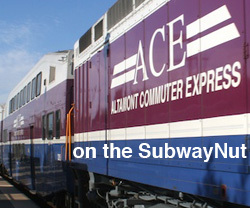 On October 19, 1998 the Altamont Commuter Express opened. This weekday peak-hour peak direction Commuter Rail line runs northeast to Stockton, connecting the tech industries in Silicon Valley to the Tri-Valley and Stockton, more affordable bedroom communities. 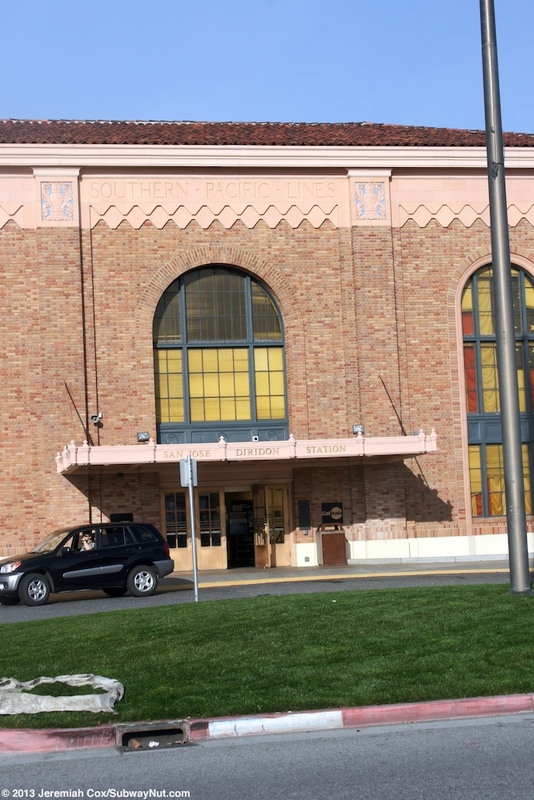 Amtrak sells tickets on PM Stockton-bound (AM trains don't connect to anything) ACE Rail Trains along with Thruway Bus Service to Stockton to connect with San Joaquin Trains. 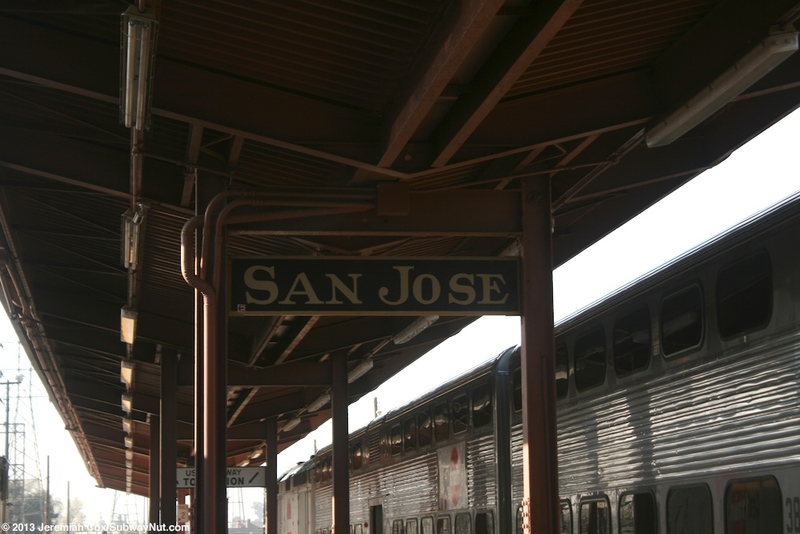 Although there are only 8 Amtrak trains per day in San Jose with Thruway Buses for connections passengers can reach nearly any destination in California aboard Amtrak. Local transit service finally arrived directly to Diridon Station with the VTA Light Rail tunneling beneath the northern side of the station, platforms and rail yards and opening its new platforms on opposite side of the mainline tracks from the depot on August 1, 2005. The large brick train station is set back from Cahill Street with a drop of loop who's grassy middle becomes a blog long median green park framed by Stover Street (to the north) and Crandell Street (south). 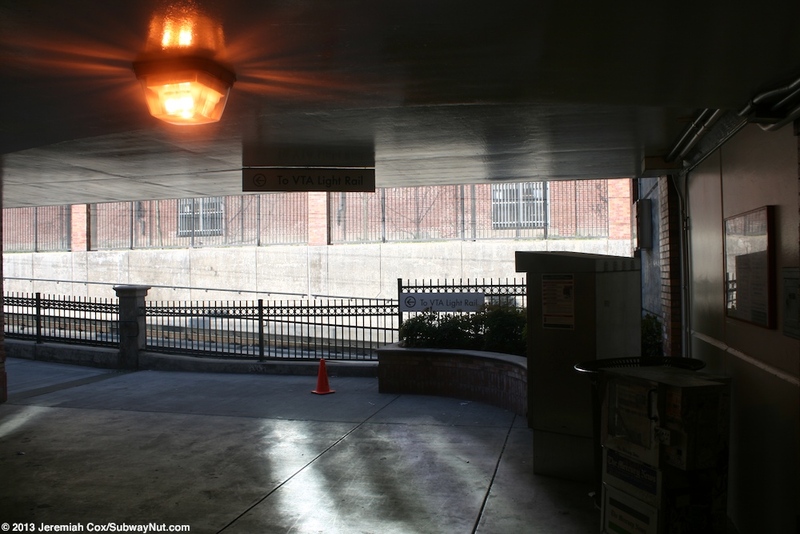 The main station building has an exposed to the elements with 3 loops bus area just north of the station (Amtrak Thruway Connections stop here closest to the platforms). 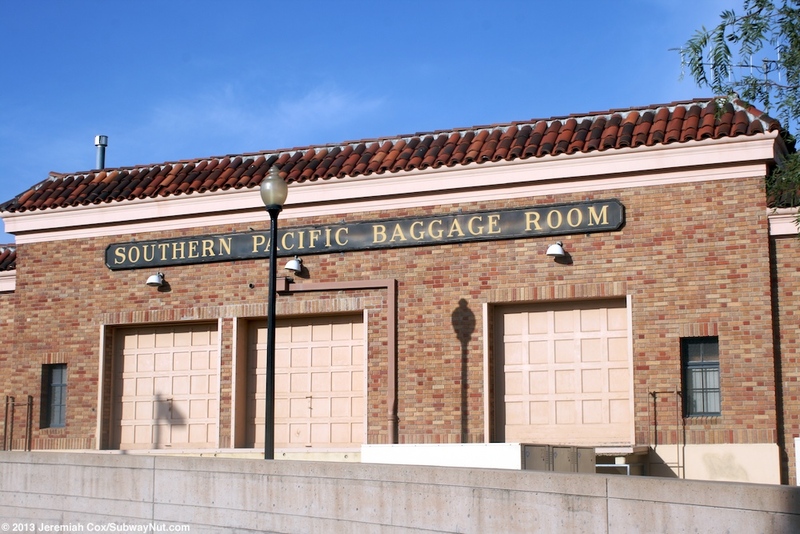 Extending south from the main train station is an attached single-story freight house that still has a golden lettered sign for Southern Pacific Baggage Room. Entering through the main entrance with a wide awning covering the drop off area passengers come to a grand but relatively small (for such a large, grand station) main room. The station has an ornate wooden ceiling and wooden benches with arms are in the center of the room. 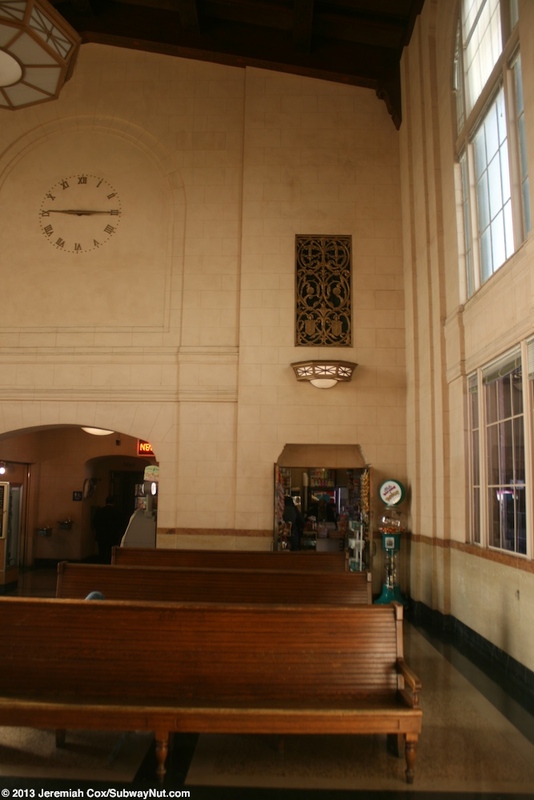 The walls look like marble Along one wall (without proper windows, left open, just a desk) is the Amtrak ticket offices and baggage check. ACE tickets are also sold by the Amtrak agents with a few validators in the station. 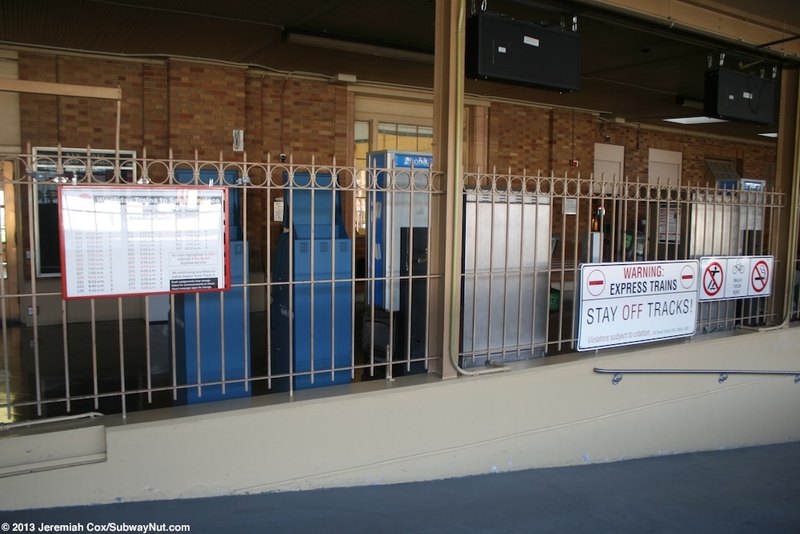 Caltrain also had a ticket agent here until it decided to close its final two ticket offices (the other at Downtown San Francisco) on October 11, 2010. 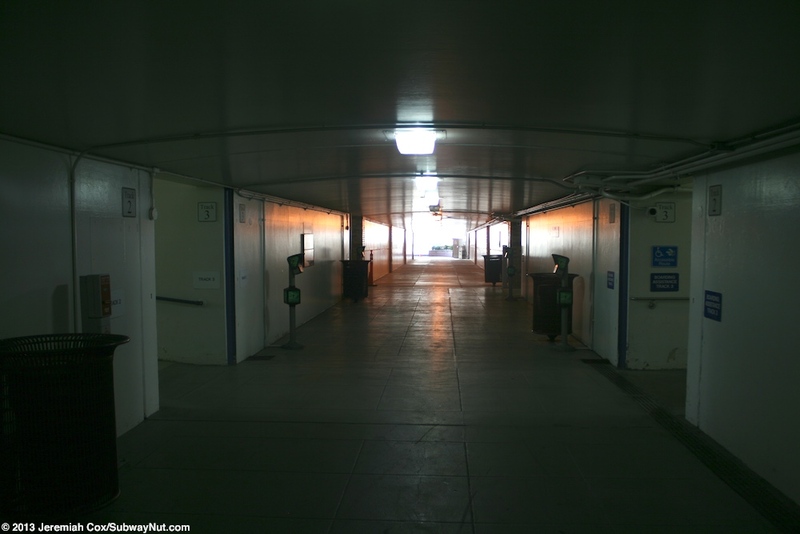 All Caltrain tickets must now be purchased at TVMs inside the pedestrian subway to trains and at the entrance to this tunnel. 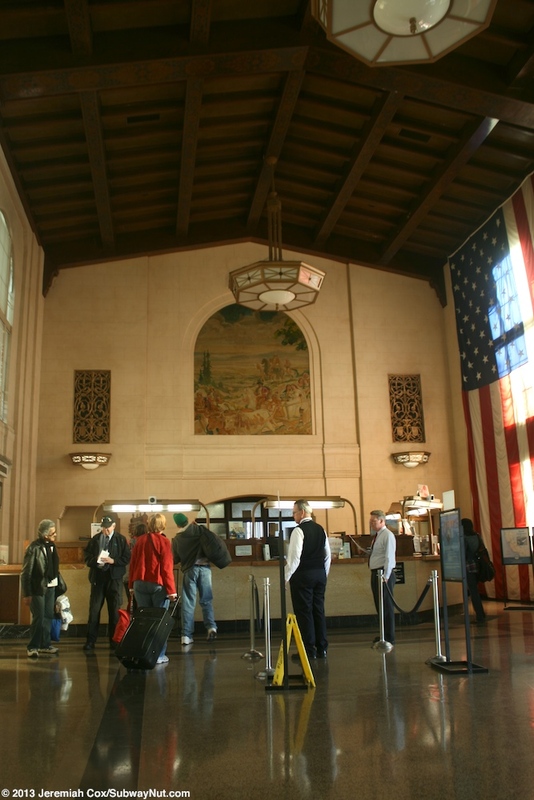 Above and behind the ticket counter a mural by John MacQuarrie portrays San Jose as it appeared in 1935, with the Lick Observatory and a train in the background. Leaving the station towards the tracks passengers reach an enclosed by casement windows area that has most Caltrain information. One issue with this station is the lack of a unified departure board and track information system. 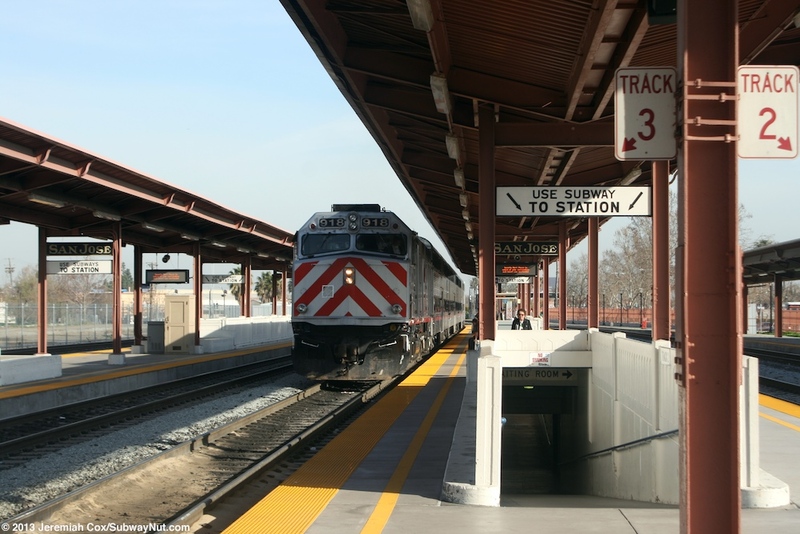 Amtrak Capitol Corridor and ACE trains use one notification system while Caltrain uses its own similar LED signs on each platform. 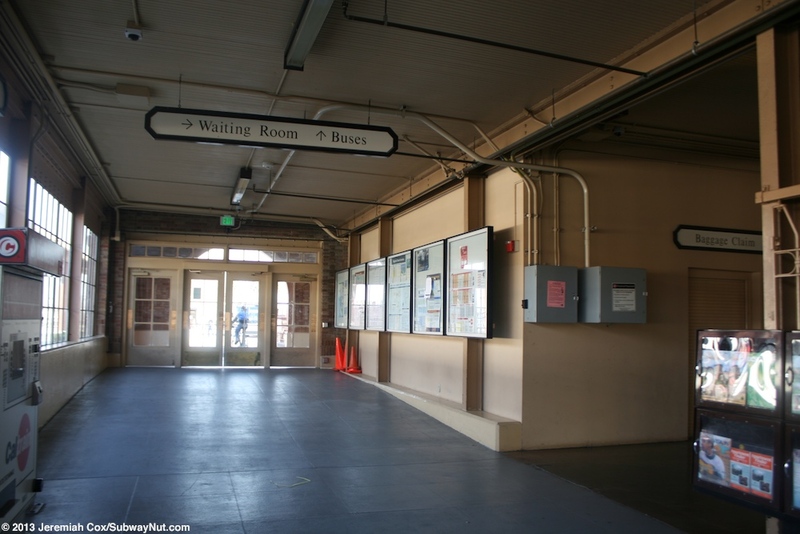 Passengers in the station are expected to look up Caltrain tracks on preprinted signs with lists of all departures (and some generalizations, like all trains to Tamien and Gilroy always depart from the same track throughout the station). 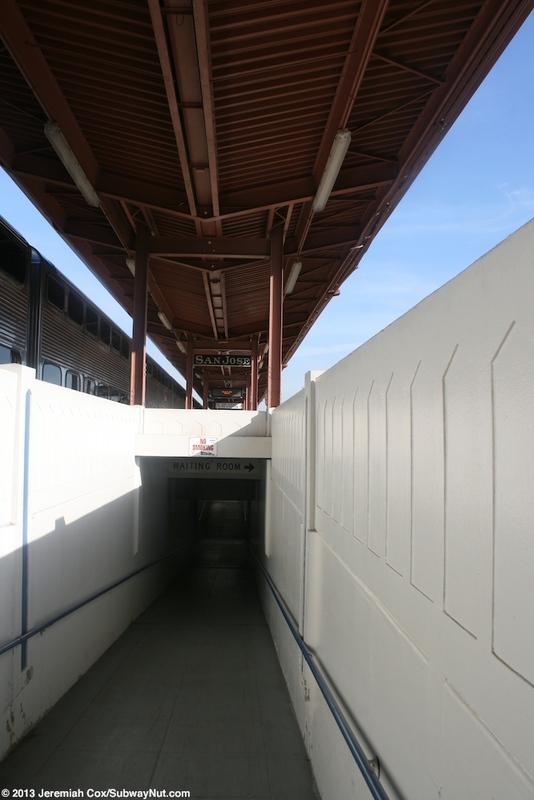 From this enclosed area along the platform for track 1 is the ramp down into the pedestrian subway that leads to all other platforms (with a ramp up to each) and to the VTA San Jose Diridon Light Rail station at the other end of the overpass. For tracks and platforms the station (was originally built with?) 5 tracks and 3 platforms with a side platform along the depot for track 1 and two island platforms for the other four tracks. These are numbered 1 through 5 There is a much longer side platform for track 1 that extends a bit north of the station (as the other tracks switch onto each other). This track is normally used by the Coast Starlight. The side platform has its own simple red beamed canopy structure over the middle portion outside the depot and the other two platforms do as well. Tracks 6 through 9 (with two island platforms) parrellel and west to the original 5 are new platforms built to replace a former rail yard along the station between about 2010 to 2012. These platforms are similar to the other two island platforms but about double the length, extending way south from the station and look to be longer than the platform for track 1. These platforms are similar to the other two island platforms, with two ramps to the pedestrian subway but clearly newer with a more modern looking canopy structure. 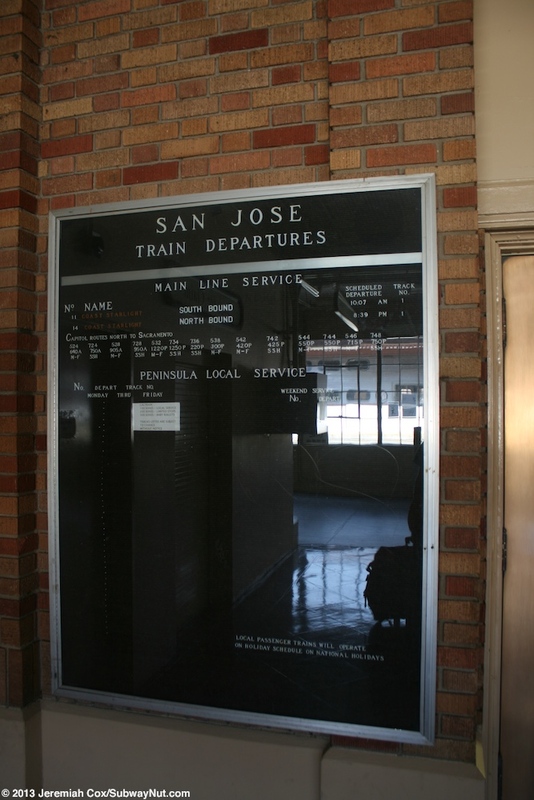 The signage for them is also more modern in the normal Caltrain black text on white format, not a non-standardized collection of gold San Jose signs and others saying use subway to station.